Jesus exemplified how gospel and medical ministry are always joined together. Church pioneers showed how physicians and ministers are joined together. Join us this year as we discuss how modern medicine and gospel ministry can be joined together. We will have a track specifically for ministers, so bring your pastor. Come enjoy intellectual stimulation, social networking, and spiritual emphasis during this special 10th anniversary conference in San Diego. Closest Airport: San Diego International Airport (SAN). 5:30pm – Business meeting: ALL AMEN members are encouraged to arrive in time to attend the business meeting. Your voice & vote matter! Airport Transportation: The hotel is approximately 7 miles from the airport. Loews Coronado Bay: $129/night + tax. Book your room directly with the hotel by calling (800) 235-6397 or booking online. Make sure to tell them you are with the AMEN conference to get the reduced rate. Loews is 6 miles from the Marriott but still located on gorgeous Coronado Island. It too is a fantastic property at an incredible rate! Internet: Complimentary in guestrooms and public areas. The Marriott is Sold Out – Coronado Island Marriott Resort & Spa: $139/night + tax. Book your room directly with the hotel by calling (619) 435-3000. Make sure to tell them you are with the AMEN conference to get the reduced rate. Internet: Complimentary in guestrooms and public areas. However, there is a fee for use in the conference center. AMEN is pleased to offer medical, dental and pastoral continuing education credits this year. Medical= 6 CME*; Dental = 5 CDE; Pastors = 1.25 CE. *The Kettering Health Network is accredited by the Ohio State Medical Association (OSMA) to provide continuing medical education for physicians. The Kettering Health Network designates this live activity for a maximum of 6 hours AMA PRA Category 1 CreditTM. Physicians should only claim credit commensurate with the extent of their participation in the activity. Children’s programs will be offered throughout the conference with social activities Saturday evening.More details will be available as the conference approaches. Coronado Island Marriott Spa & Fitness Center offers tennis courts, a basketball court, a heated 75-foot lap pool and many other amenities. Surrey bikes can be rented right at the resort and ridden on the paved path immediately outside the hotel. Tidelands Park (with playground) is about a 3-minute walk from the hotel. Coronado Ferry Landing – about a 7-minute walk from the hotel – is a charming collection of shops, art galleries and restaurants surrounded by swaying palms, waterfalls and a beautiful skyline view of downtown San Diego. There is a reasonably priced ferry from Coronado to cross the bay to visit downtown San Diego. 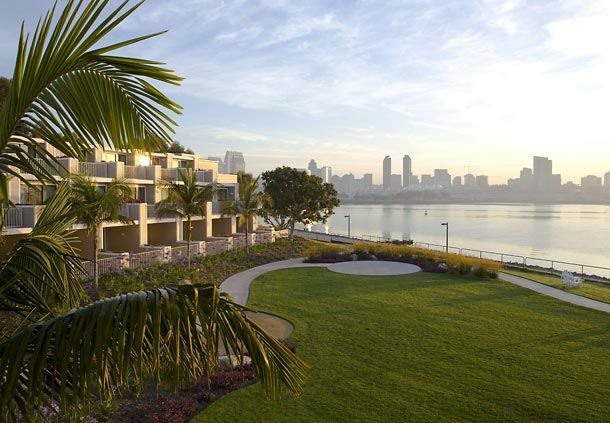 We know you and your family will LOVE this charming location across the bay from downtown San Diego for the 2014 AMEN conference! Mission-minded organizations are encouraged to consider having an exhibit at the AMEN conference. We only have about 18 slots available so register now. Learn more.